Shopatron, a growing technology company based in San Luis Obispo, competes both locally and nationally to find world-class talent to drive our business forward. Recruiting and retaining great people in the Central Coast requires a unique approach. Rather than build a refuge from the concrete jungle of Silicon Valley, like a Google or Facebook campus, Shopatron simply enables our people to get out of the office and play once a while. Our latest employee engagement program, Shopatron Clubs, is a good example of our Central Coast culture in action. The Shopatron Clubs program has three goals: foster grassroots leadership, encourage teamwork, and promote healthy activities. Shopatron Clubs provides seed money to any group that aligns with those goals. Each club is funded with a budget of around $1,500 to start. Our CrossFit club bought kettle bells, boxes to jump on, and cones to run around. Our cycling club bought a community bike pump and racks, making lunchtime rides more convenient. Our yoga club pays for an instructor to come in and teach a class on site once a week. Soon after the Clubs program was announced, a few employees noticed the Stanford Rugby paraphernalia hanging in my office. With grins on their faces, they were standing at my door saying, “Ed, we need to start a Shopatron rugby club.” How could I say no? If, like a lot of people, you’re fuzzy on the rules of rugby, here’s all you need to know: It’s played on a large field, much like football or soccer. Traditionally, there fifteen players on a side. But recently, seven-a-side has gained such popularity that it will be an Olympic event in 2016. Rugby games have the flow and continuity of soccer but involve lots of tackling, bruises, and blood — even more than football. It took me about a minute to agree to start a rugby club at Shopatron. Sure, I could get hurt, and so could any employees who played, but that is the way living a full life works. You try to start something. Danger is involved. Failure is a real possibility. We had three people who agreed to play on our team, and we needed 10. More than 10 percent of Shopatron’s male employee base would need to play for our team to field an entry for the Tri-Tip seven-a-side tournament in San Luis Obispo on Sept. 7. It was early May. Recruitment for the team began. We played touch rugby at lunchtime on Wednesdays to expose the game to newbies. After just a few practices, things started taking shape. We had seven guys committed (unfortunately no women wanted to play – although I am a big fan of women’s rugby). I was determined, and so were the rest of the guys. 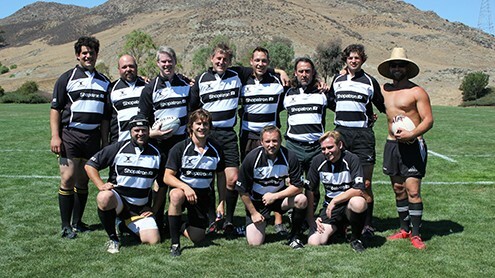 We hooked up with the San Luis Obispo Rugby Football Club and trained with them. Thankfully, we picked up a few generous players who wanted to play for the “corporate sponsored” team in town. Then, we got out there and played on that warm Saturday morning. Five of our players had never stepped on a rugby pitch in a live game. Despite our lack of experience, we won our first game 14-12. It was a triumph — really, a miracle. We had met the first milestone of success. We went from absolutely nothing to a team with a name, jerseys, and a warm-up routine. We had hung our shingle on the door, and we had made our first dollar. After the games, guys on the team were already talking about next season. They wanted more. At Shopatron, we want to be the company where Type A people on the Central Coast go to get their make-a-difference-in-the-world fix. Relax on the beach on weekends. Maybe play some rugby. Then change the world with incredible technology and customer service when they step into the office on Monday morning. Creating a rugby team from scratch and competing in live games was the perfect embodiment of Central Coast work-life balance, and a good example of how taking risks is just part of the game of life and business. 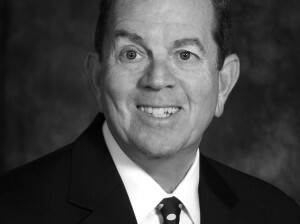 • Ed Stevens is the founder and CEO of Shopatron, a San Luis Obispo-based e-commerce firm.